As he leads ag sustainability efforts at USDA, Northey has three big opportunities to scale conservation and productivity innovations nationwide. When USDA engages a broad range of stakeholders from the public, private and nonprofit sectors, the conservation outcomes are exponentially larger than when parties go it alone. Public-private partnerships, such as those funded through the Regional Conservation Partnership Program, offer invaluable ways to stretch limited federal dollars to maximize technical and financial resources for growers. Still, there’s always room for improvement, and the next farm bill can refine RCPP to be more user-friendly and impactful. To reduce burdens on participants, RCPP projects should allow for greater innovation and flexibility in conservation practices. To strengthen environmental outcomes, USDA will need Conservation Technical Assistance funding, and projects should prioritize critical watersheds and demonstrate measurable progress. USDA’s NRCS can only be as effective as the science guiding its work – and that often lags behind innovations happening on farms and in universities. Through unglamorous but important procedural changes, Northey can boost NRCS’ ability to identify, assess and incorporate new science and technology into the Conservation Practice Standards for various programs. A national panel should transparently and regularly review updates from universities, the private sector, State Technical Committees and Conservation Innovation Grants. USDA will also need to increase training for state- and district-level NRCS staff and partners to ensure farmers have access to the most effective conservation strategies for their soil and climate type. Crop insurance is a critical safety net for farmers operating in an increasingly unpredictable environment. Insurance premiums and payouts don’t account for the impact of conservation practices in managing risk – largely because data linking specific practices to risk reduction is hard to come by. That’s where Northey has a game-changing role to play. By anonymizing and aggregating data already held by the agencies he manages, Northey will make it possible for trusted researchers to study how conservation practices work in specific geographies, impact yield variability, and build soil health and climate resilience. It would be a breakthrough – giving farmers actionable information for managing risk, increasing profitability and scaling sustainability. As the head of the farm production and conservation agencies at USDA, Northey can drive change by increasing the impact of public-private partnerships, prioritizing science-based innovation at NRCS and ensuring farmers are rewarded for measures that increase operational resilience. 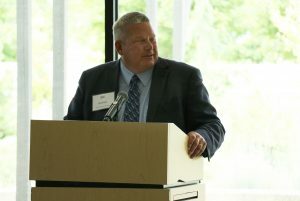 This entry was posted in Partnerships, Supply Chain, Sustainable Agriculture and tagged Conservation Practice Standards, Conservation Technical Assistance, farm bill, public-private partnerships, regional conservation partnership program, U.S. Department of Agriculture, Undersecretary Bill Northey, USDA, USDA NRCS. Bookmark the permalink. Both comments and trackbacks are currently closed.